FIGURE 13.3 Schematic of an atomic force microscope. 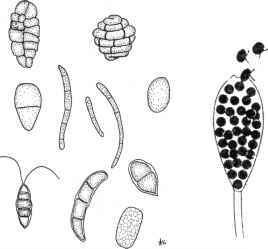 are amenable to electron microscopy) and living cells (which can be seen using light microscopy). Figure 13.3 is a schematic diagram of an atomic force microscope. In AFM an extremely sharp probe is brought into atomic contact with a surface and is scanned systematically over the surface. Topographic features on the surface and the tip of the probe interact with aggregate atomic forces as the probe is scanned over the surface. The sharp probe is attached to a flexible cantilever extending from a rigid substrate. 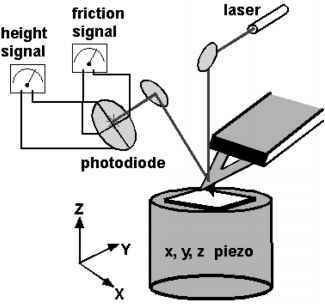 A laser is reflected from the back surface of the cantilever; deflection of the tip, as it moves over surface topography, is detected as the reflection changes position on four elements of a positionsensitive diode. The differential signal between the sum signal of the top two elements and the sum signal of the bottom two elements provide a measure of the deflection of the cantilever. Similarly, the differential signal between the sum signal of the left two elements and the sum signal of the right two elements provides a measure of the torsion of the cantilever, which is a measure of the friction between the probe and sample. FIGURE 13.4 AFM images of DNA. (a) linear DNA, (b) linear DNA with ABFp2 packing protein, (c) highly supercoiled DNA. reduces lateral forces. In tapping mode, the vertical position of the sample is continually adjusted by a feedback mechanism, in order to maintain constant amplitude for the freely oscillating probe. Changes in the oscillation amplitude, in response to attractive or repulsive forces between the sample and the tip, are monitored. These changes are transformed into topographic information. The past decade has seen continuous progress in the quality of AFM imaging of biological samples. In particular, membrane proteins,8,9 DNA,10,11 and DNA-protein complexes12 have been intensively studied. Examples of DNA imaged using an atomic force microscope with a standard commercial silicon tip and operating in tapping mode are shown in Figure 13.4. The image in Figure 13.4a shows linear DNA; in Figure 13.4b, ABF2p, a packing protein, was added to the DNA sample, resulting in compaction. Figure 13.4c shows highly supercoiled DNA resulting from adding TOTO-1, a dye that intercalates between base pairs. Despite decades of study of viruses and their pressing importance in human medicine, many of their structural properties are poorly understood. Because of their heterogeneity and lack of symmetry, large viruses are often not amenable to X-ray crystallographic analysis or reconstruction by cryo-electron microscopy (cryo-EM). AFM can be effectively used to image the intact structures of large viruses,13 and their internal structures can be revealed by AFM in combination with chemical and enzymatic dissection.14,15 Development of AFM as a diagnostic tool to probe the structures and function of human viruses has the capacity to provide important information on their structure, function, and assembly. FIGURE 13.5 (a,b) In situ AFM images of turnip yellow mosaic virus particles immobilized in the crystalline lattice clearly display capsomers on the surface of the T = 3 icosahedral virions. (c) The structure of the capsid of turnip yellow mosaic virus based on X-ray diffraction analysis. The clarity with which structural detail can be recorded on the surfaces of small plant viruses, such as TYMV, suggested that AFM may be even more broadly useful as an analytical tool for macromolecular structural investigations and provide important topographical information on large macromolec-ular ensembles such as human and other animal viruses that would otherwise be lacking. Fragility and structural heterogeneity can render such viruses troublesome targets for X-ray crystallography. The only alternative approach to date, cryo-EM, yields resolutions from 8 A upwards.18 A limitation of this method, however, is that it benefits greatly from high particle symmetry, such as icosahedral symmetry, and is far less powerful for irregular, polymorphic virus particles. In addition, because of a low contrast in biological EM, the high resolution requires computer averaging and processing of thousands of images. FIGURE 13.6 (a) AFM image of Bacillus globigii spore. (b) High-resolution image of the protein coat of the spore. adhesion to the AFM tip. The force placed on the sample by the tip needs to be kept to a minimum so as not to deform the surface during the measurement, yet the cantilever needs to be stiff enough to overcome adhesion between the tip and sample. Imaging spores in fluid should increase resolution, since the tip does not have to penetrate the water layer that is typically on samples measured in air under ambient conditions.